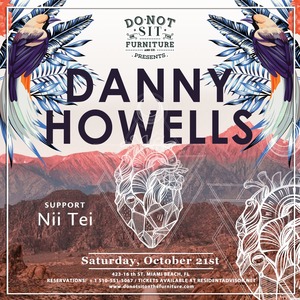 Saturday, October 21st, Do Not Sit On The Furniture presents the legendaryDanny Howells[ Dig Deeper Records]https://soundcloud.com/danny-howellshttps://twitter.com/danny_howellsSupport by:Nii TeiDanny Howells' style is unprecedented and he has become insistent throughout the world. With over 20 years of taking to the decks, Danny has held residencies at Arc, Ministry of Sound, Twilo, Renaissance, The End, and Bedrock, as well as his own Dig Deeper events across the globe. His profound connection to the audience allows him to take control of each and every dance-floor.